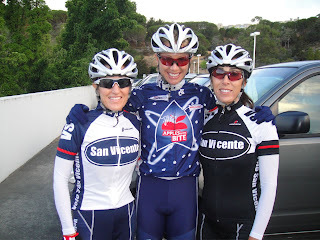 Join one of America's top professional cyclists, Dotsie Bausch, and the staff of Revolution Coaching for an unforgettable week of training in the beautiful Santa Barbara Wine Country. Whether you are a recreational rider, new to racing, or a seasoned veteran, this camp will take you further than you dreamed possible. Our daily training rides will focus on group and individual riding skills, climbing/descending, time trialing, and sprinting. All rides are fully supported. Daily lectures topics will include information on the latest training techniques, nutrition, mental toughness, strength and flexibility training, injury prevention, and bike mechanic basics.........all tailored to the female aspect of the sport. Plan to check-in November 1, 2:00 for orientation, bike checks, meet and greet dinner, and wine tasting. Checkout is November 7 12:00, when we end with a group hug, and you depart a new and improved athlete, ready to tackle any challenge. * Hands on instruction in group riding, race tactics and more! * One hour massage (Additional massages available at extra charge). * More FUN than you’ve had on your bike in a long time—maybe ever! friend or teammate to camp with them! Limited to 12 participants. Coaching staff ratio 1 to 2-3 riders. R E S E R V E Y O U R S P A C E T O D A Y! August's Empower Athlete of the Month is 16 year old junior, Scott Stern! He has been chosen for his consistent dedication to being at his best, his unwavering perseverance, his work ethic and for being motivated and determined after a recent disappointment. How an athlete mentally deals with a disappointing result or a big defeat is what separates the great from the good. Scott attended USA Cycling's talent id camp last month in Colorado. He was prepared and focused going into this camp. He was ready to rip some legs off! He was one of the top 16 year olds and came in 6th out of his division after the time trial tests they held at camp. They took the top 5 to Belgium this month for racing. SO close! Racing in Belgium is one of Scott's goals, but Scott did not let this derail his focus and desire to be a great bike racer. He came home and used that disappointment to train even harder and race even smarter, and in his next 2 races made it on the podium in both! The way he took the bull by the horns and came out with two great results immediately after that disappointment is what champions are made of! Scott was resilient and resiliency is a big key to continuing success in life and in cycling at a competitive level. Scott has a very bright future in bike racing. Don't be surprised if you see him in the green jersey in the Tour de France in 8 or 9 years! ECS: What motivates you to train so hard and stay so focused on a daily basis when no one is watching? SS: Knowing that all of the hard work I put into my training schedule will pay off by getting great results. SS: Dotsie is not only someone who just gives you a training plan and that's it, she also educates all of her clients on traveling tips, correct nutrition, recovery, tactics, and one of the most important parts of being an excellent cyclist is the mental aspect of training and racing. ECS: What prank would you play on your coach if you could do anything you wanted? SS: Before a ride when my coach is not looking I would take the tube out of the tire and put the tire back making it impossible to ride on. ECS: When you get your monthly Empower coaching Schedule, what do you look forward to seeing on it the most and what do you look forward to the least? SS: The thing I look forward to the most on my monthly schedule is to see how I will be ramping my training up for a specific race and seeing those long hard group rides throughout the month. There is nothing I dislike about my training schedule because I know everything that is on there will make me a stronger rider. ECS:: Any advice you have for a new rider beginning with Empower Coaching Systems? SS: Listen to your coach no matter what they say, stick to your schedule, and always be in communication with your coach. ECS: What are your goals for 2009 and in 2010? SS:My goals for the rest of the season are podium at states road race and podium at states time trial. For 2010 my goals are the US National Team, top 10 at Red River Gorge stage race, and top 10 at Soto classic.